I was born in Israel, though my family left when I was a little over two years old, and I’ve only gotten back about once every ten years. But every visit is endlessly fascinating, and it can be hard to assimilate all the impressions and insights and experiences such a trip produces. As I think back to my last visit, this past December – a trip with my wife and daughter for a combination of business and pleasure – I find it helpful to return to one organizing theme: walls. Real walls and metaphorical walls. Walls made of stone and walls made of fabric. Walls that divide and walls that unite. For Jews, the most famous wall in Israel is the Kotel, the Western Wall, actually one part of the retaining wall of the Temple Mount. I must say that, even on my last visit, I no longer felt the obligatory awe and emotion at the Kotel. This was not for lack of faith or even of temperament. In fact, all that I expected to feel at the Kotel but didn’t, spiritually and emotionally, I did end up feeling when I prayed with a minyan at the grave of Rabbi Isaac Luria, the great Kabbalist knows as the Ari, in the mystical city of Safed. But the Kotel itself seemed too oversold, and too politicized, to provoke, at least in me, the depth of response that it deserved. On this visit, I expected to be jaded again. And I was. But one thing had changed. Directly to the north of the postcard-famous open-air area in front of the Kotel there is an enclosed prayer room carved in the space under Wilson’s Arch, the remains of an ancient bridge that once connected the Temple Mount to the upper city of Jerusalem. Since my last visit, this space has been expanded and embellished into a great vaulted hall. The front wall of this chamber is, of course, another stretch of the great Herodian western retaining wall itself, which is to say just a further stretch of the Kotel. But, here, this span of the Kotel connects with the arch above and then the wall behind. Torah arks are lined up at the front. Shelves of books and a balcony are at the back. It is a synagogue of sorts. And, somehow, in this hall, at this time, the presence of God seemed real. Maybe I was only reacting to the novelty of this newly beautified space. Maybe the fervor of the prayers just seemed more concentrated than in the open air. Or maybe, I think, it had something to with the function that the wall itself played. Outdoors, the Kotel is an exterior wall, marking the outer boundary of the holy space of the Temple Mount. Inside the hall under Wilson’s Arch, it is an interior wall; it surrounds and protects, marking a holy space within. The point is not that I prefer to be inside a synagogue than outside The Temple. It is, rather, that the same wall that looms so high, and guards the outer precincts of the navel of the universe, and has stood sublime for so many centuries, can also condescend, so to speak, to shelter worshippers from the rain, the tourists, and the fuss. I touched the wall, and felt holiness. Then, after praying, I went outdoors, and touched the Wall, the same Wall. And it was holy still. On Shabbat during our stay in Jerusalem, we attended services at Shira Hadashah, a precedent-breaking Orthodox minyan in which women lead many of the prayers, receive aliyot, and share equally in the reading of the Torah. We expected a small group, and were amazed to walk into a room with hundreds of worshippers, fervently praying and raising beautiful melodies. As someone who usually attends Conservative synagogues, egalitarianism is nothing new to me. Indeed, by typical Conservative standards, Shira Hadashah still isn’t fully egalitarian. Nevertheless, praying there, that one Shabbat, was incredibly exciting. One could sense history in the making, as uncompromisingly Orthodox Jews, relying on meticulous halakhic arguments, dared, in a spirit of joy and faith, to stretch the boundaries of accepted practice. Shira Hadashah has a mechitza, the traditional barrier, or dividing wall, between men and women. Their mechitza is a low sheer curtain that goes straight down the middle of the room, with women sitting on one side and men on the other. The table from which the Torah is read is smack in the middle too, half in the women’s side and half in the men’s side. This mechitza – this wall – did not so much separate the men and women in the service (except in a physical sense) as it linked them like the two poles of an electrical circuit. And the charge in the room was truly palpable, as melodies and spiritual energy and leadership passed back and forth. The mechitza, as an object and an institution, has probably throughout its history always carried the potential to be a wall that joins together rather than divides, but that potential has been suppressed by the legacy of women’s subordination. Here, finally, the potential was released. Truly, history was being made. For the world, the most famous wall in Israel these days is probably not the Kotel, but the wall, also known as the fence, or the separation barrier, that the Israelis have built to separate themselves from the Palestinian communities of the West Bank. 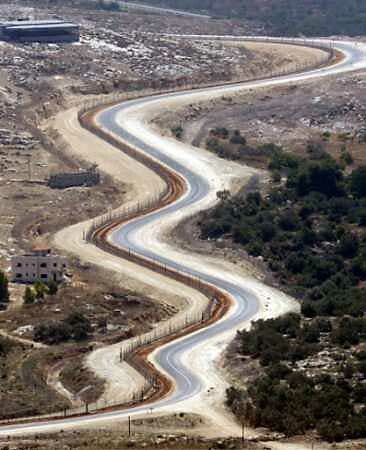 I do not want here to get into the political and legal debate over the separation barrier. It certainly has sharply reduced the opportunities for suicide bombings and other terrorist attacks inside Israel, and, as far as I am concerned, that is justification enough for its existence. Nevertheless, this wall, however necessary and effective, must surely be a source of regret. They say that “good fences make good neighbors.” But this is no rural fence over which neighboring farmers chat about crop prices. Walls, as I’ve tried to show here, can indeed unite. They can also embrace. They can inspire. But this wall does none of these things. To reemphasize, the wall is necessary and effective, but it should surely be a source of regret. The wall is a physically ugly new feature of the Jerusalem and wider Israeli landscape. More important, it separates two societies that could, under better circumstances, share and learn together. One of the most striking things about Israeli society today, amidst all the worry about foreign threats and domestic political lethargy, is an incredible sense of entrepreneurial energy and optimism. Israeli entrepreneurs have managed to take full advantage of globalization; they have found technological niches and web-based business models in which their physical distance from customers in Europe and the United States is just irrelevant, or even an advantage. I kept thinking throughout my stay in Israel that if the Palestinians, whose own commitment to education remains high, could participate in this explosion of innovation and commerce with the rest of the world, the Middle East would be a very different place. To be sure, the wall is not the main reason that this is not occurring. To be sure, it is up to Palestinians themselves to transcend their political obsessions and dysfunctions, and get to the work of building the vibrant, positive, society and economy that is in their reach. But the wall – and the resulting impermeability between the two societies, along with the checkpoints and lines and attendant resentment – surely doesn’t help. The wall also has a corrosive effect on Israelis. An American friend of mine, a Jewishly-engaged law professor with a lifetime of commitment to Israel, told me of accompanying a Palestinian colleague to visit Al Quds University, the leading Arab university in the Palestinian territories. On the way back, he went with his colleague through the checkpoint set up for Palestinians. A young Israeli soldier screamed at him: “Why are you using this checkpoint? You’re Jewish! Use the other checkpoint, the one for Jews!” My friend explained that he was with a Palestinian, who would not be allowed to go through the other, faster and more benign, checkpoint. The soldier kept screaming, and screaming, and screaming. For this young Israeli, the thought that my friend would insist on staying with his Palestinian colleague, even if it meant a long and difficult wait, was inconceivable, or treasonous, or both. And that narrowing of empathy, that walling off of the imaginative faculty of the mind, surely does no good to Israelis or to anybody else. Again, my intent is not to cast blame. The wall, despite its human and political costs, might be the best solution to a dreadful dilemma. But we should not be complacent about those costs. Walls can unite, and they can divide. They can define us as standing inside, or outside. Walls can shelter, and they can endanger. They can help order our minds and souls, or rip through them. They can energize, and they can deaden. They can equalize, and they can oppress. God, you will not despise a contrite and crushed heart.